When Hannah Inglish interned at the North Country Creamery in Keeseville in far northern New York near the Canadian border for six months she didn’t know it was the penultimate step in her transition from Cleveland, Ohio, yoga girl to cow herder maven and cheesemaker. She also didn’t know that a year later, eight years after she began studying pre-Christian non-theism, rolling out a yoga mat, and changing her eating habits, she would be making arrangements to move away from where there were 5000 people per square city mile to 15 people per square country mile, with only her boyfriend in tow, and take up farming. “I didn’t know it was going to happen so quickly,” she said. Born in Oklahoma, she and her sister grew up in Lakewood, an inner-ring old school suburb of Cleveland, and graduated from Lakewood High School. In her senior year she started reading Alan Watts, the British-born philosopher and populariser of Zen Buddhism in the 1960s and 1970s. Satyananda Yoga professes an integrated approach to the practice and is known as the yoga of the head, heart, and hands. The next year she signed on and went to Yogaville for three months to train as a yoga teacher. Once back home in Lakewood, certified to teach the hatha style of Integral Yoga, she freelanced, teaching around town, but was disillusioned by the high cost of classes at studios and the prevailing focus on yoga as a workout. The next summer, with her boyfriend Max, she returned to Yogaville for another three months, but this time as an intern cooking for the ashram’s community. Returning home that fall, inspired by her kitchen work at Yogaville, she found employment at the Root Cafe, a local vegetarian restaurant, organic bakery, and espresso bar doubling as a community clubhouse featuring local music and art. But, the next summer she broke her wrist while crowd surfing in the mosh pit at a heavy metal concert and was unable to do kitchen work for several months. After her slam danced wrist got better she returned to work, but her job at the Root Café having been filled, she instead found a new job at Earth Fare, an organic and natural food market in neighboring Fairview Park. Destiny has been described as the opportunities that arise to turn left or right when coming to a crossroad. Sometimes it takes karma to work out the windings on the road from Yogaville to Cheeseville. It was the website of the National Young Farmer’s Coalition. Hannah Inglish filled out an application for an internship, posted her resume, and sat back to wait. She didn’t wait long. According to the National Young Farmer’s Coalition, most of today’s young American farmers are first generation farmers, primarily interested in growing organic foodstuffs and grass-fed dairy and beef. Steve Googin and his partner Ashlee Kleinhammer, co-owners of Clover Mead Farm and the creamery, bought and rehabbed a small trailer for Hannah to live in. They tore out its thin carpet, replaced it with hardwood flooring, and parked it under the stars. A stray cat showed up. She went to work milking the twenty cows, feeding the calves, and doing the many odd jobs that farms have an endless supply of. No sooner than she had gotten the hang of herding and milking the shorthorns and Jerseys in her care than the plans Mr. Googin and Ms. Kleinhammer had been making to open a farm café to sell their milk, yogurt, and cheese bore fruit. They hired a cook with experience at New York City’s Blue Hill at Stone Farms to manage the café and put Hannah in charge of the cheese. Cheese is sometimes seen as milk’s leap towards immortality, although age matters when you’re a cheese. Making cheese turned out to be the fulcrum that would take her back to Keeseville. By the end of October her internship was over and she went home again to Lakewood, saying, “I was ready to come back and see my boyfriend.” No sooner was she home, though, than she started making plans again. “Farming looks mighty easy when your plow is a pencil and you’re a thousand miles from the corn field,” Dwight Eisenhower, whose forebears were farmers, once said. Farming is hard work and farmers are compelled to start over again every morning, very early in the morning, valuing their work, love of land and water, and their communities. It’s early in the sack, early to rise, no black limos for getting to work. “The farmers around Keeseville, at Clover Mead and Mace Chasm Farms and Fledging Crow, they’re all young and it’s inspiring to see them doing that,” said Hannah. From farm to table is the cheese way. 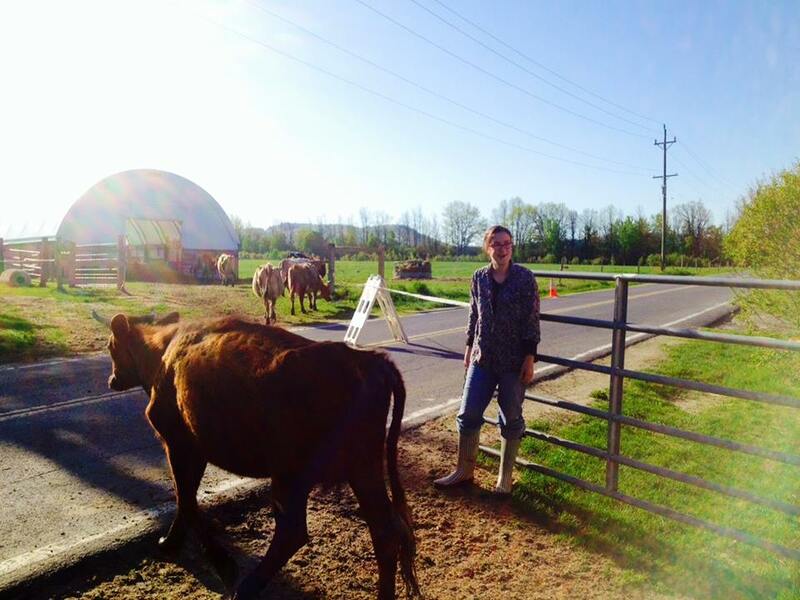 From city girl to cheesemaker to farmer is the way Hannah Inglish has made for herself. When a cow crosses her path it means the animal is going somewhere. Here comes the cheese. Once your plan has been signed sealed but not yet delivered what remains is bringing home the cows and getting them all on the tune of om on the milk machine so they can slumber away on their feet happily snoring.